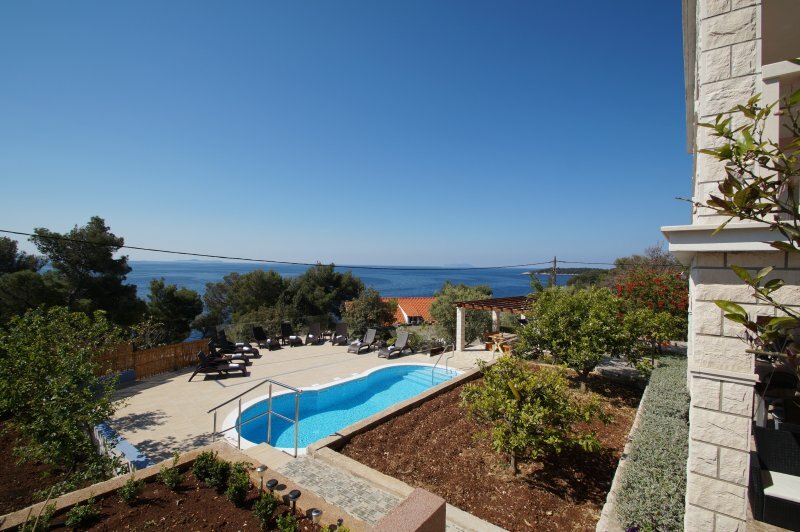 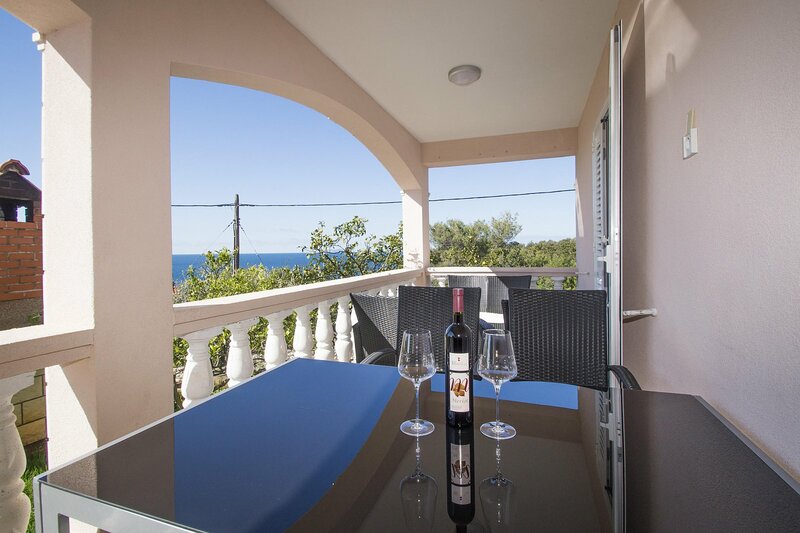 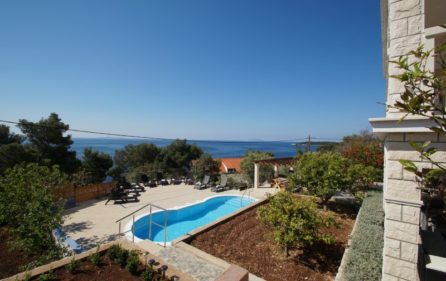 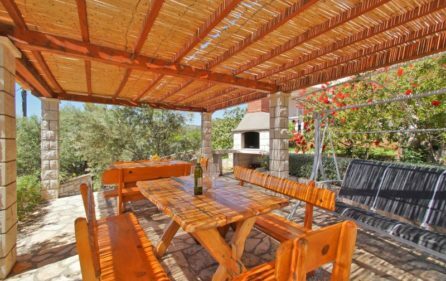 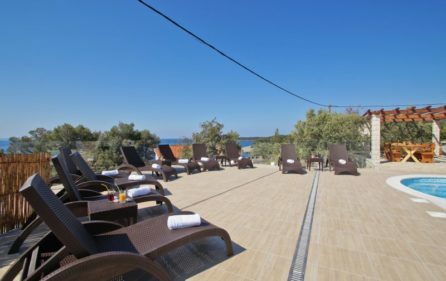 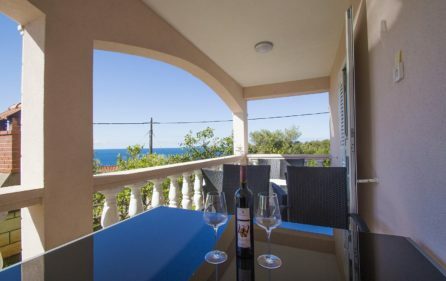 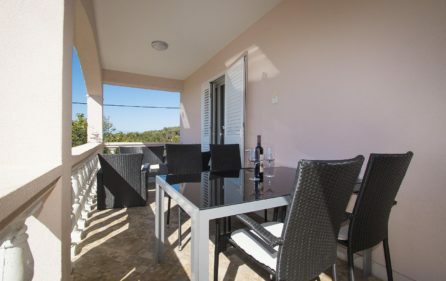 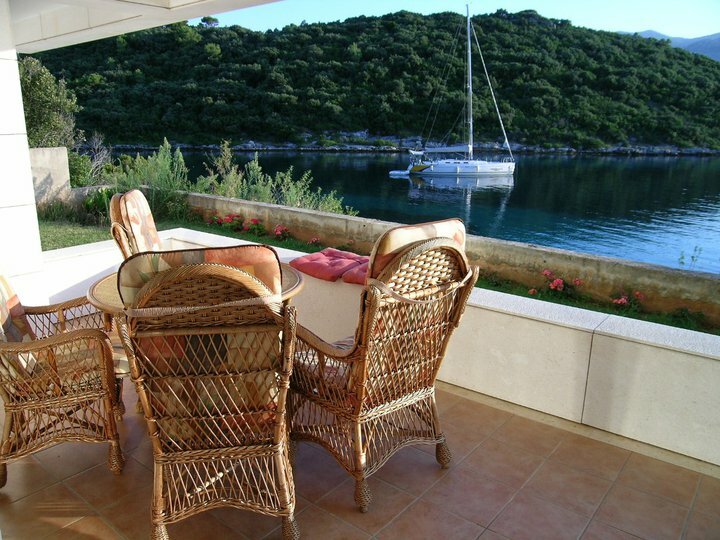 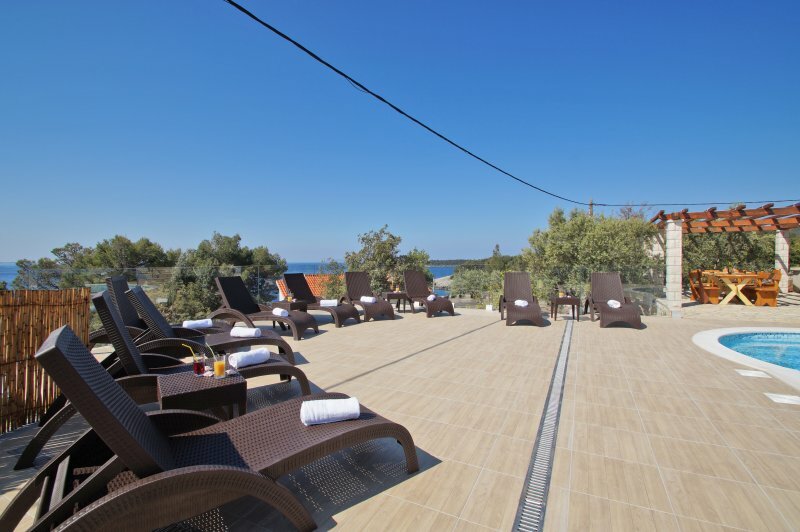 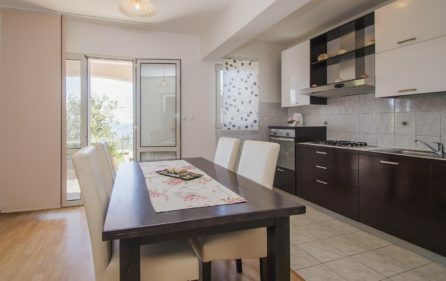 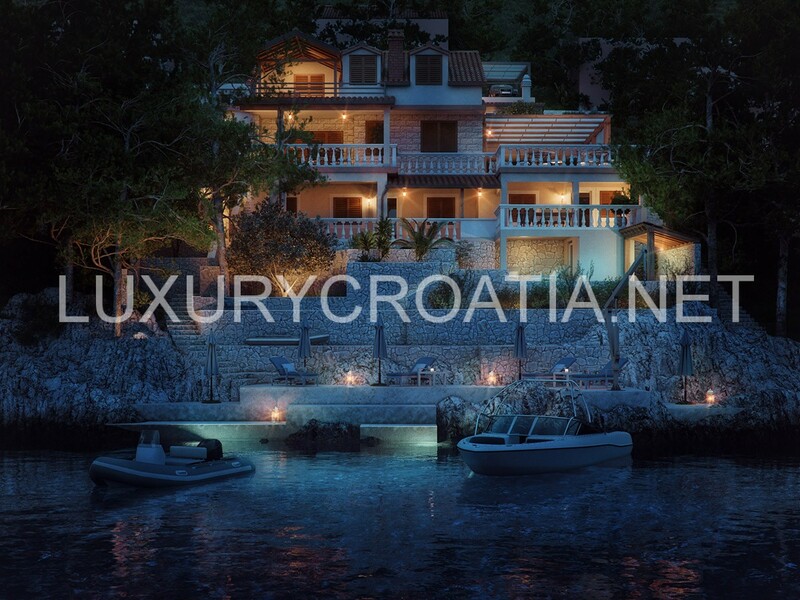 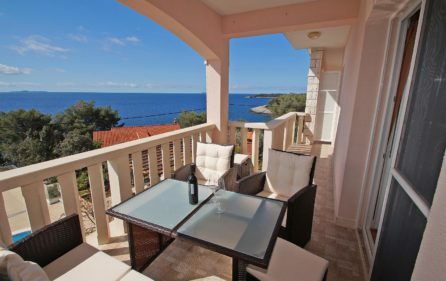 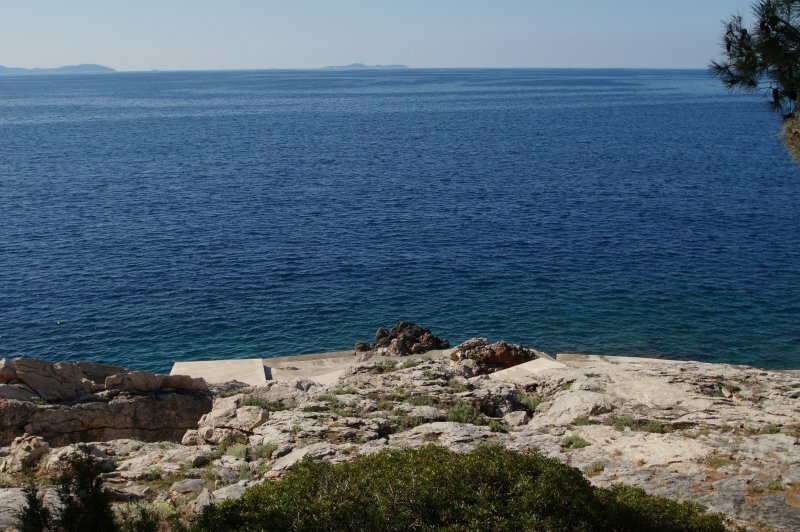 Sea view apartments with a pool, Korcula are located in a peaceful and small place, separated from the everyday noise and modern life. 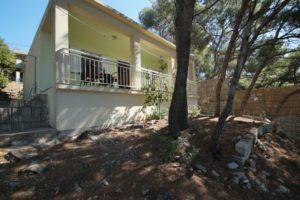 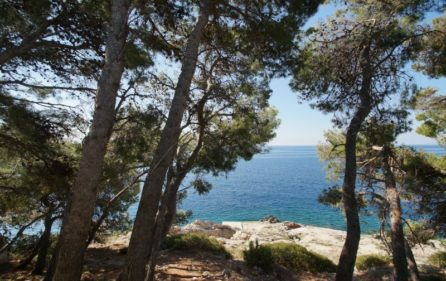 Distance from the more urban places on Korcula island is just a few kilometers away, and from the local beach only 30 meters. 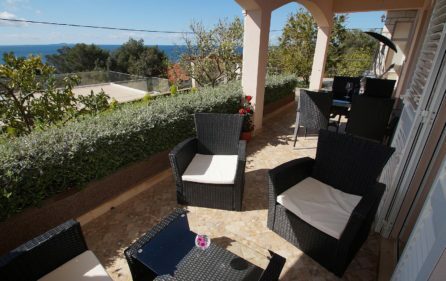 This sea view house is divided in 4 apartments and inside you will find a gym. 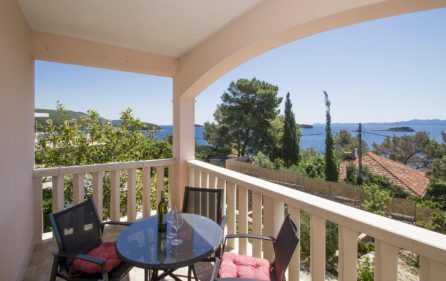 In front of the house is a spacious swimming pool with deck chairs around it. 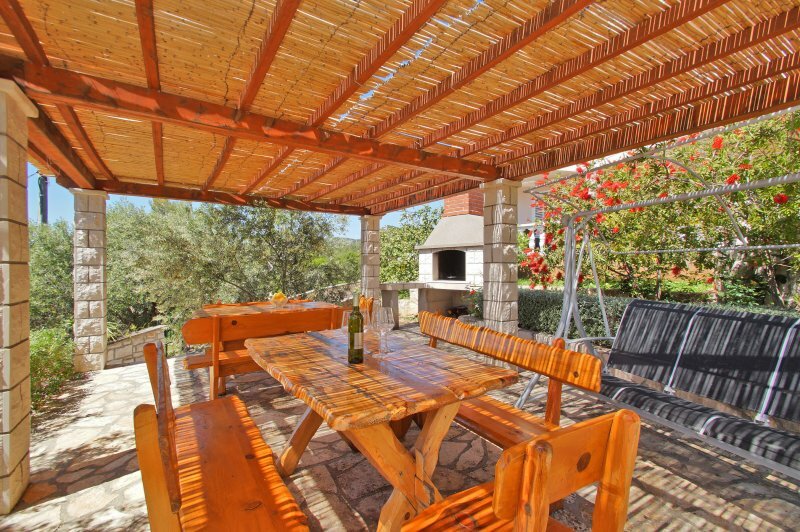 There is also a covered dining area with enough space for 20 people and a fireplace. 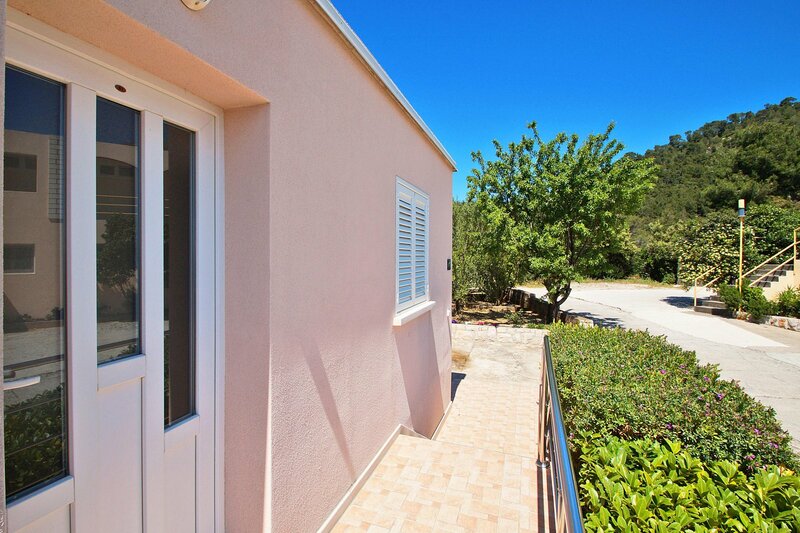 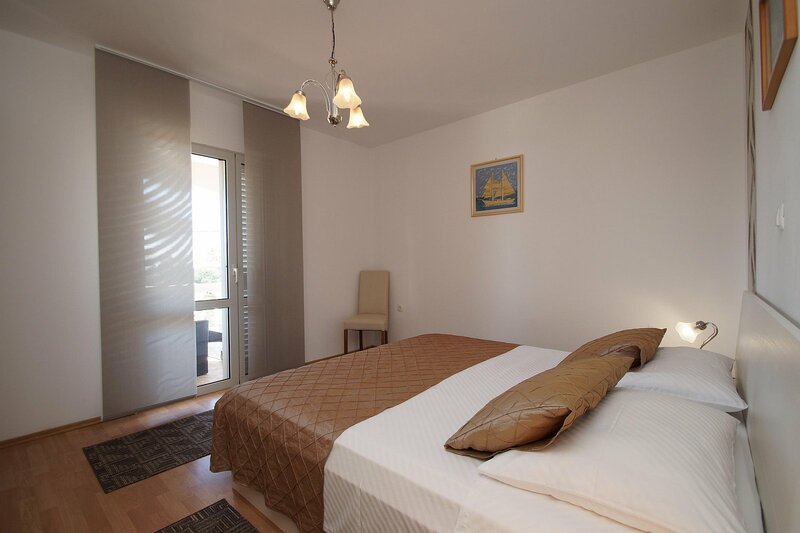 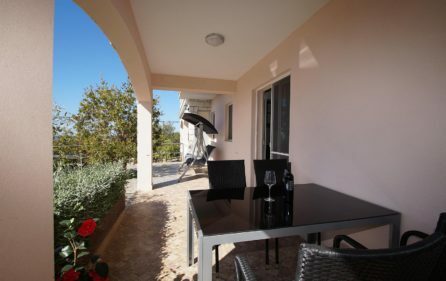 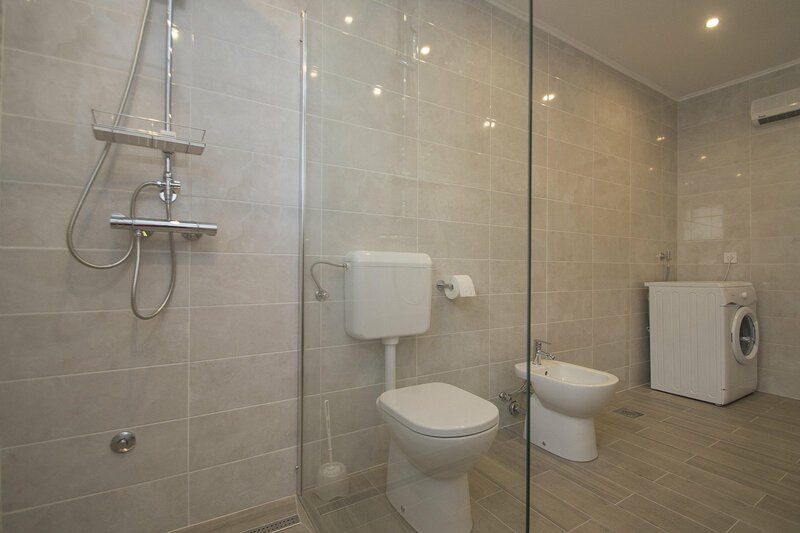 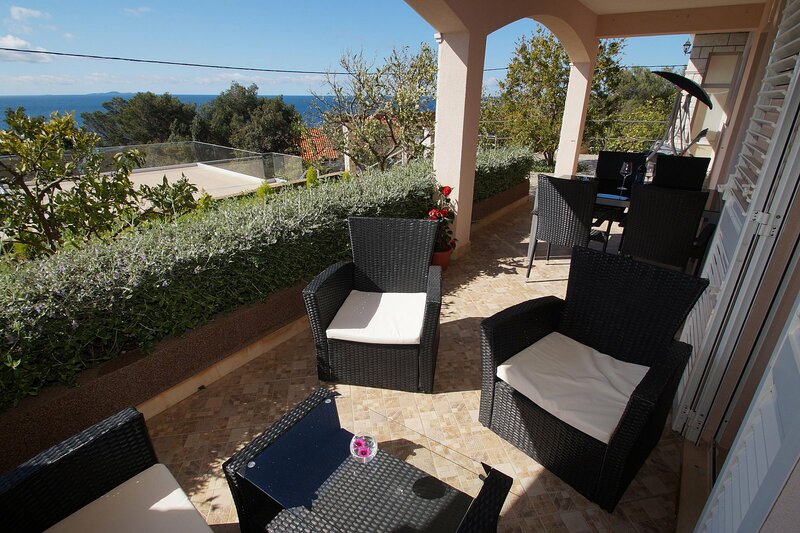 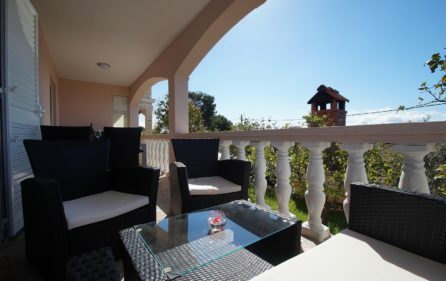 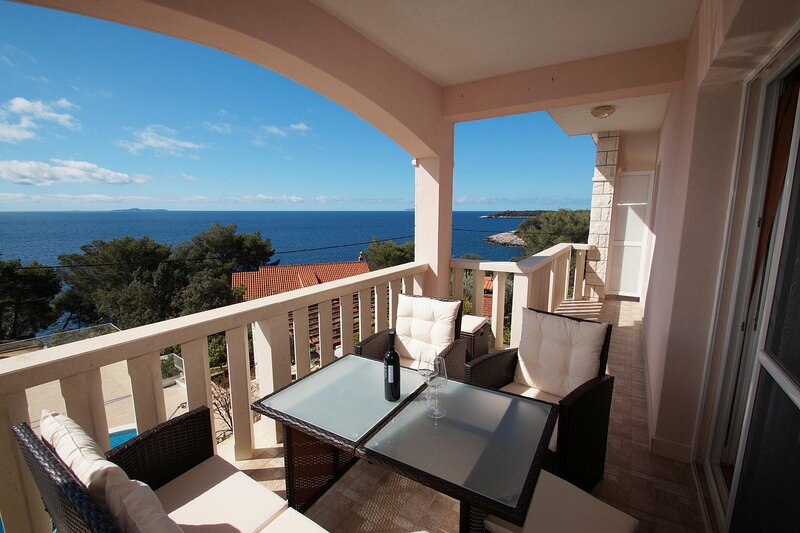 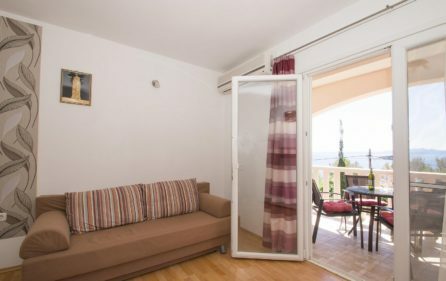 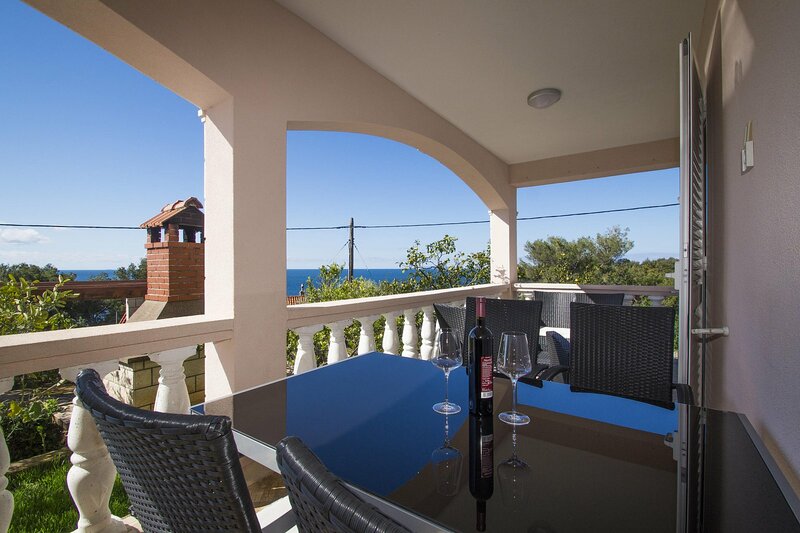 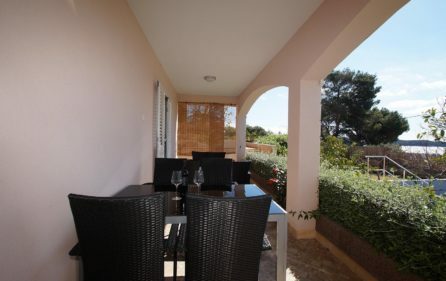 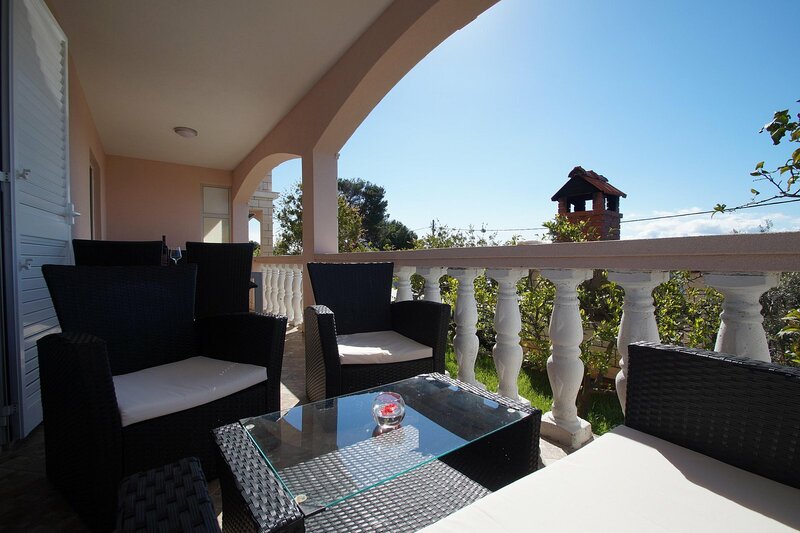 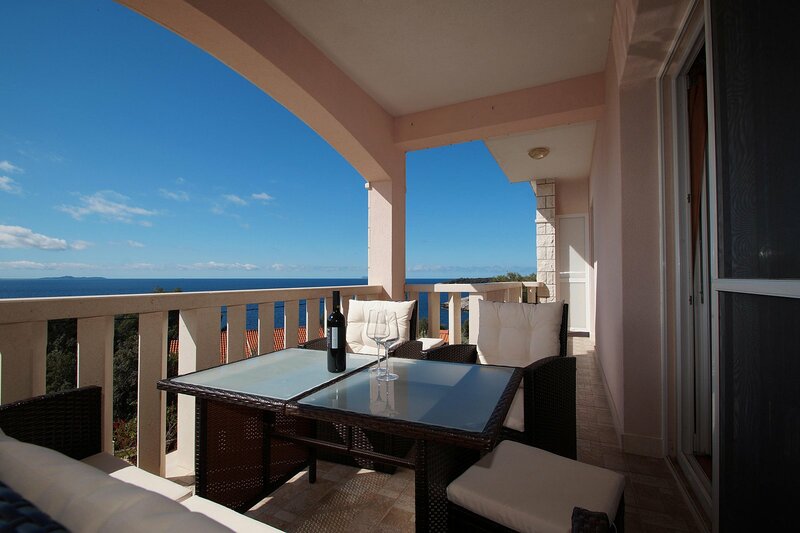 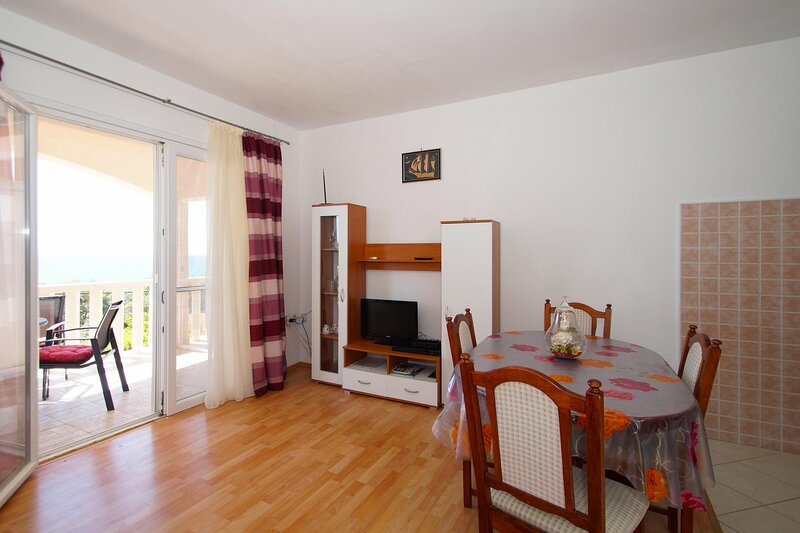 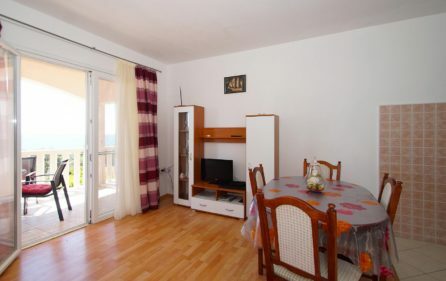 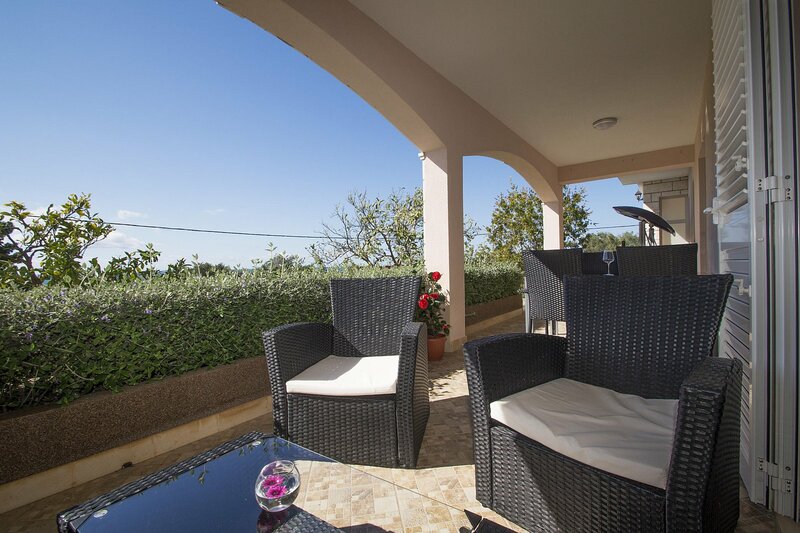 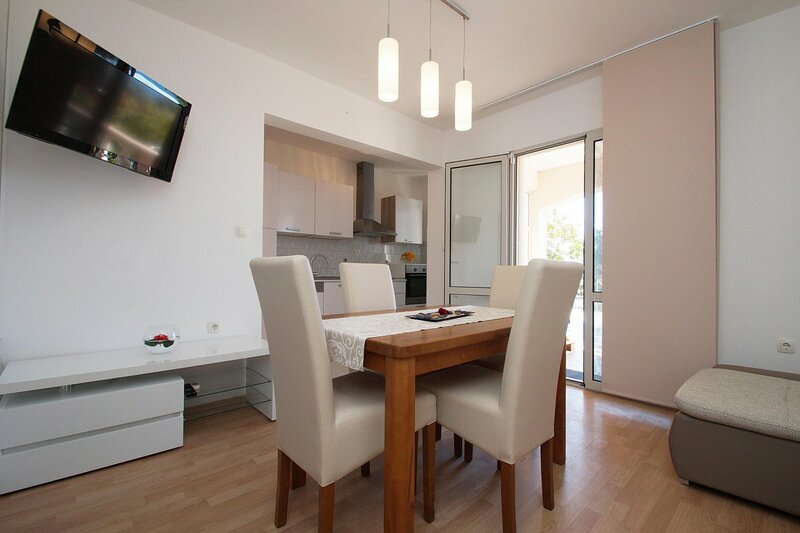 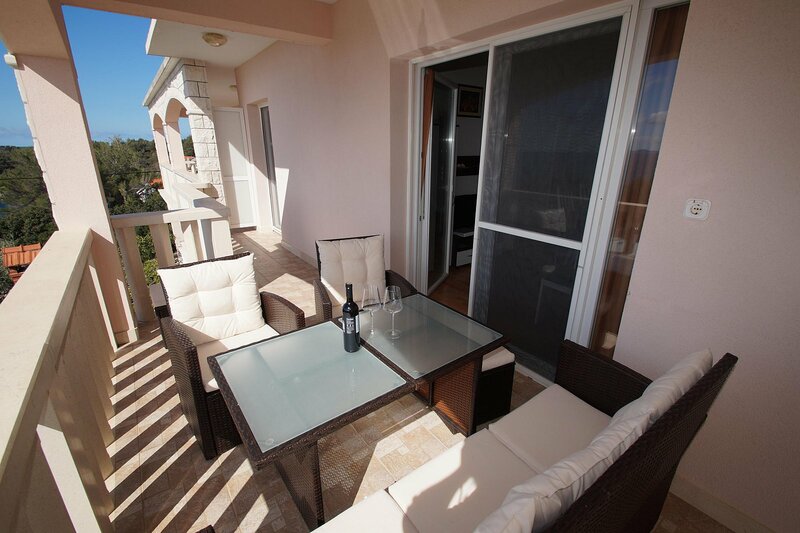 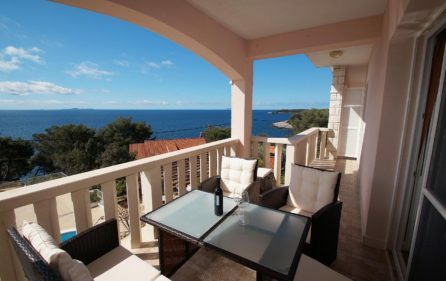 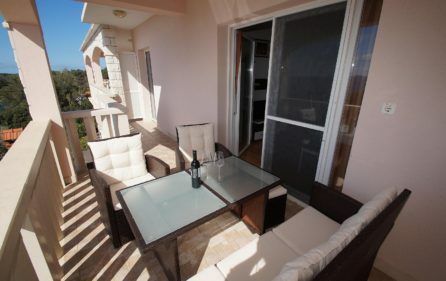 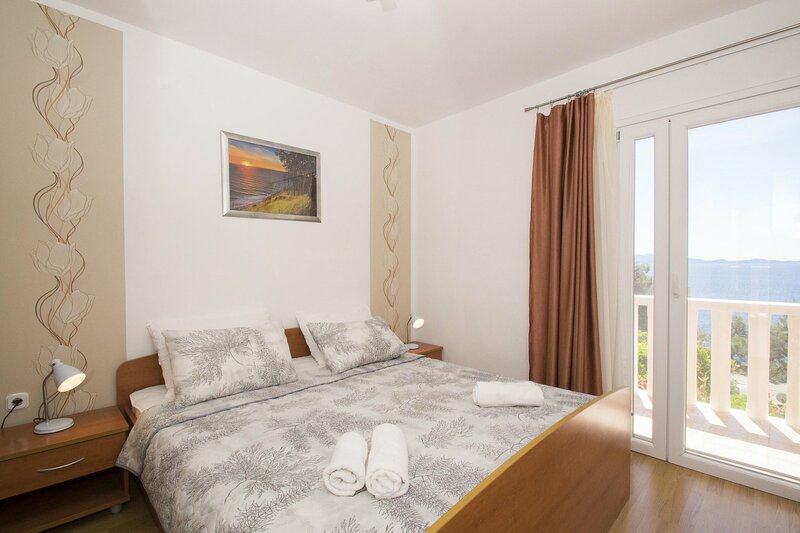 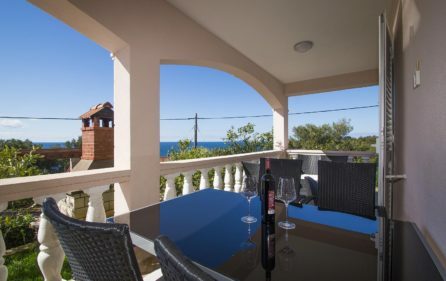 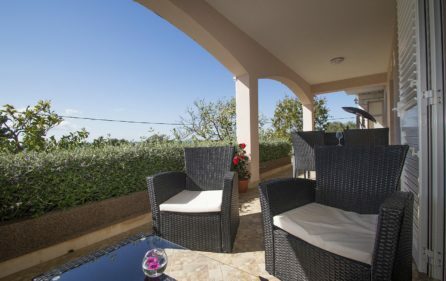 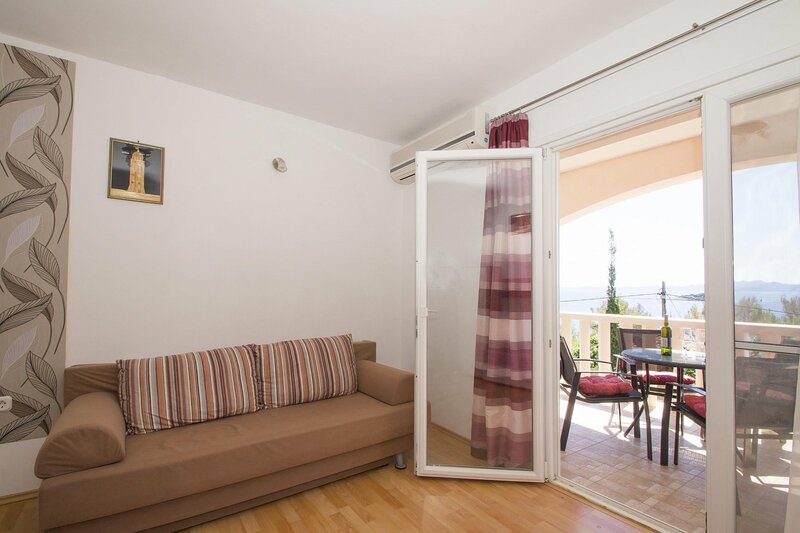 Each apartment has a balcony with a beautiful view and it is fully equipped. 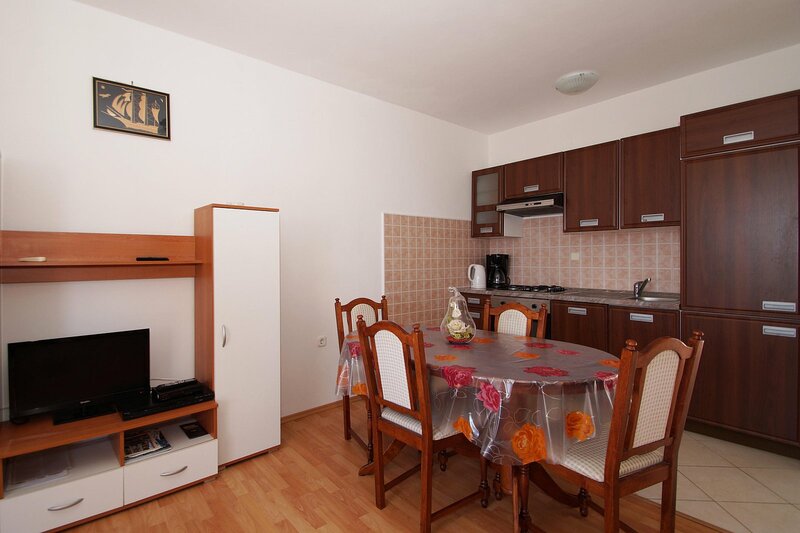 First and second apartment are situated on the ground floor and they are quite similar. 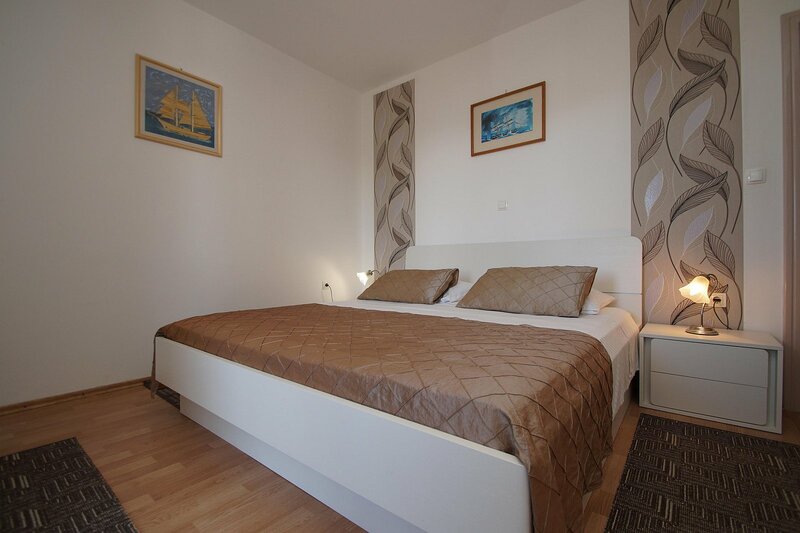 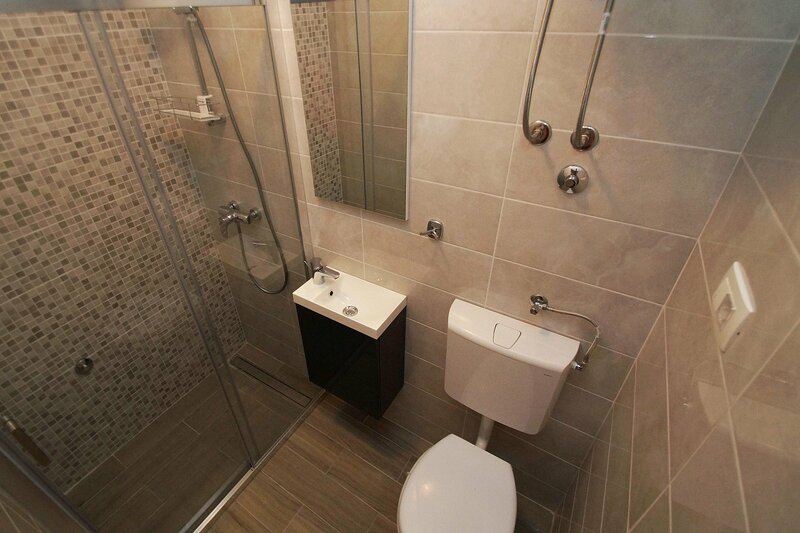 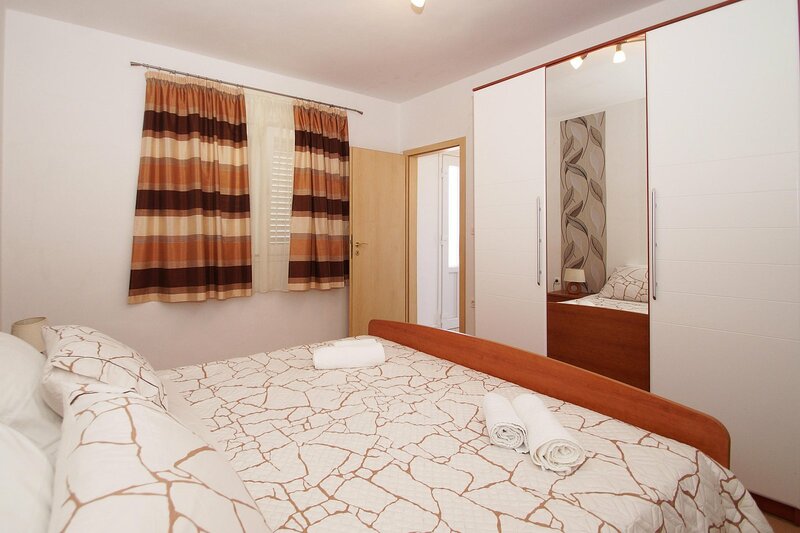 There you will find one bedroom with a king size bed and one bedroom with two single beds. 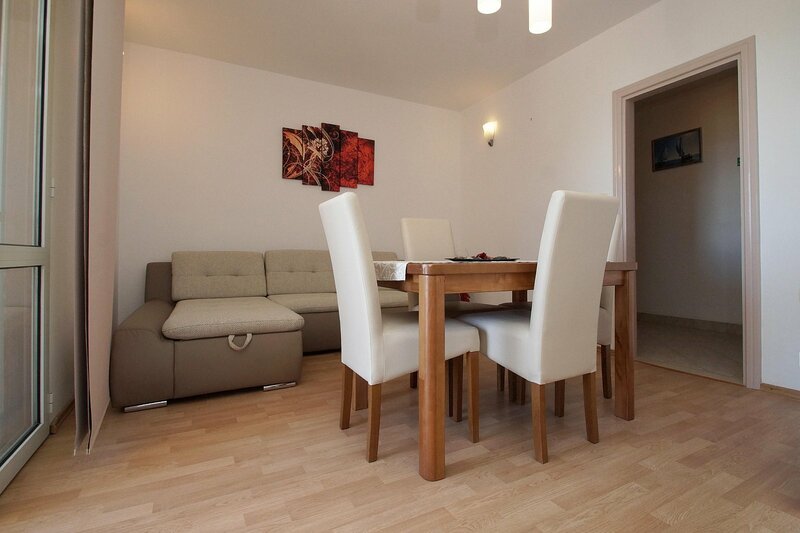 Each apartment can accommodate up to 4+1 guests (extra sofa bed). 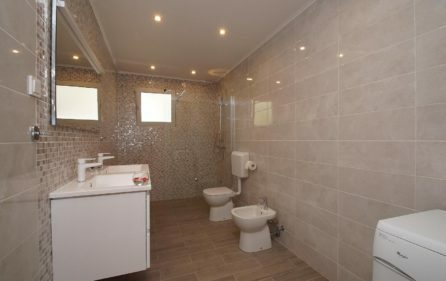 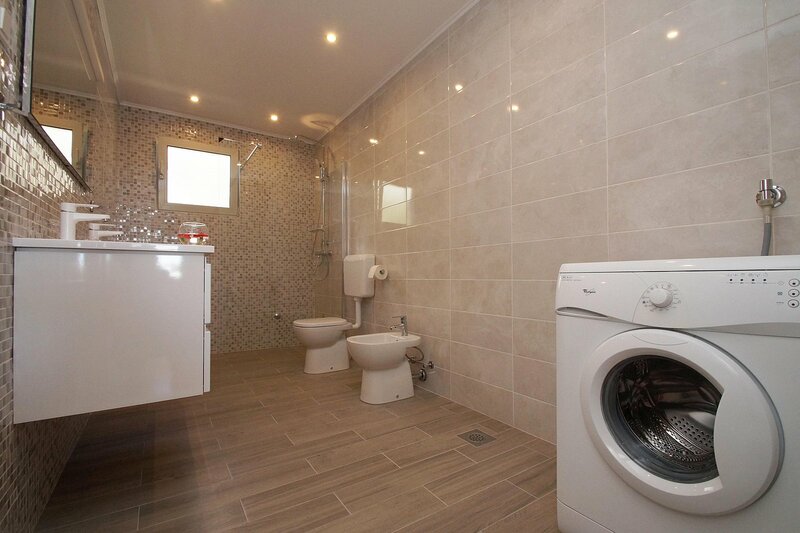 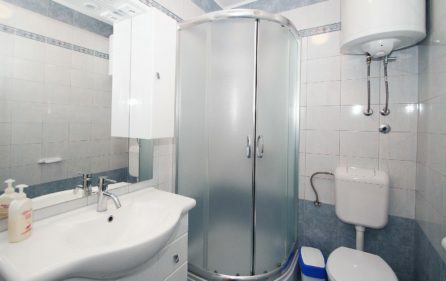 The inside consists of a living room with satellite-TV, dining area, kitchen, bathroom with all the necessities and a WC. 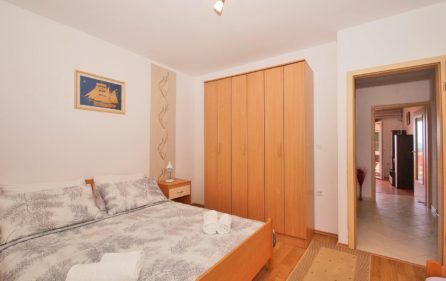 Third apartment can accommodate 2+1 guests (additional bed). 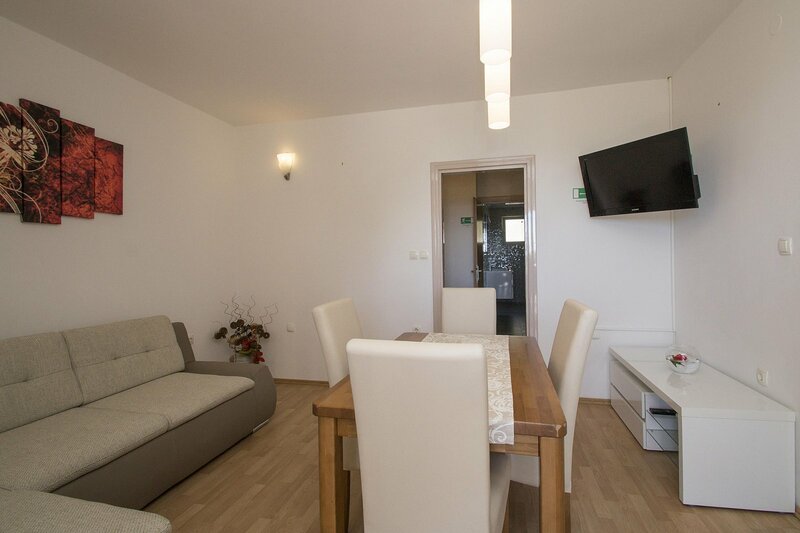 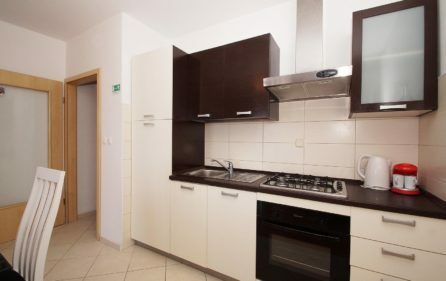 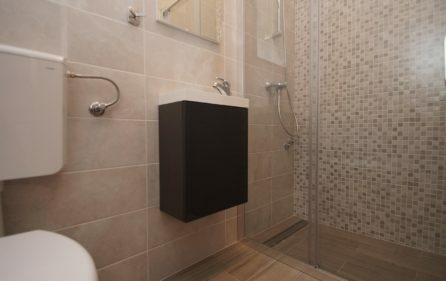 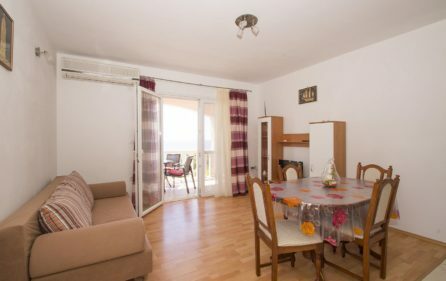 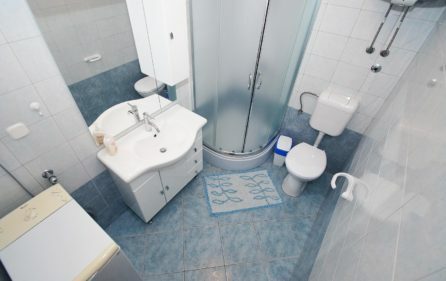 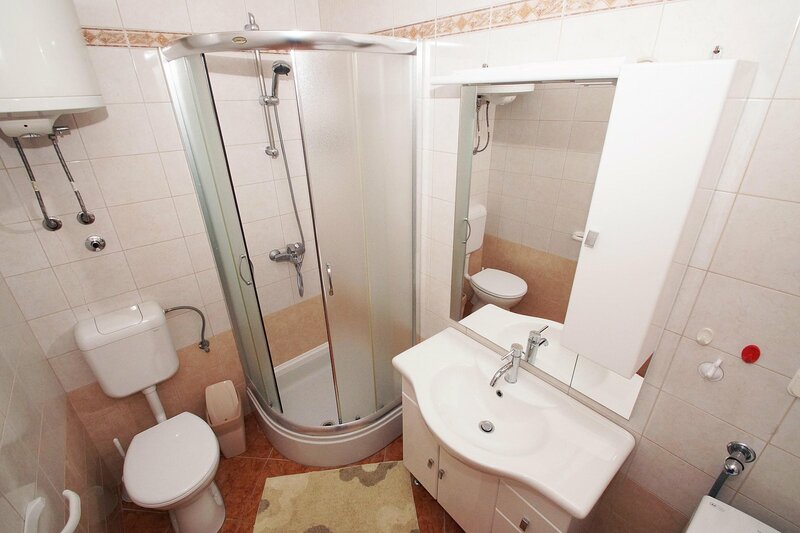 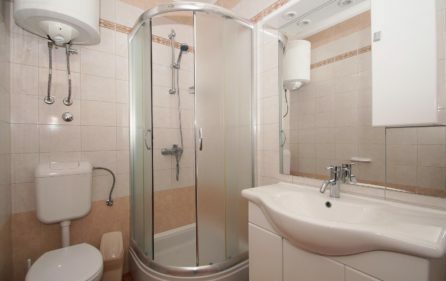 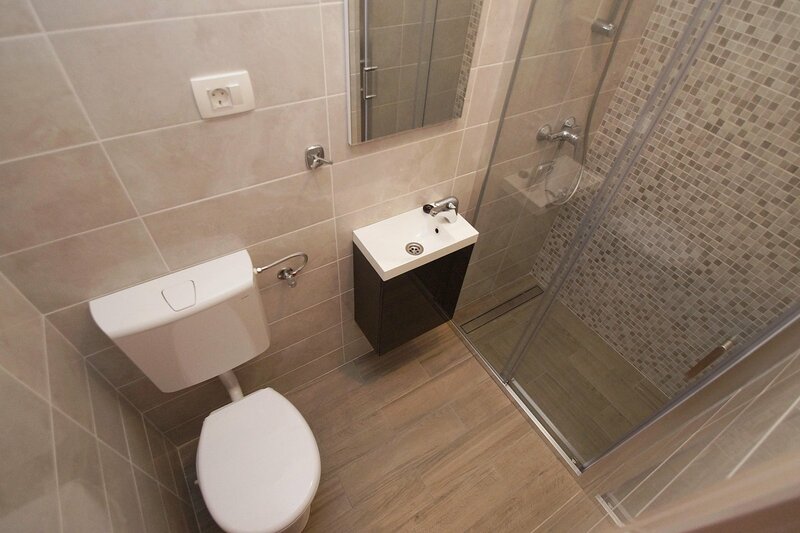 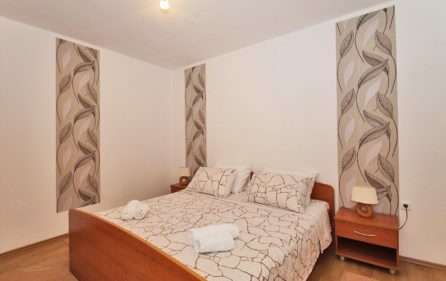 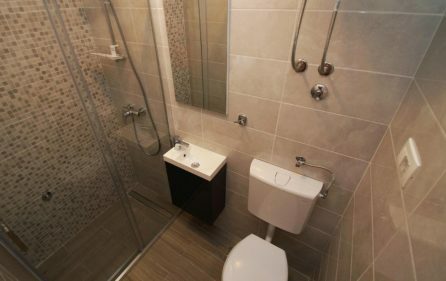 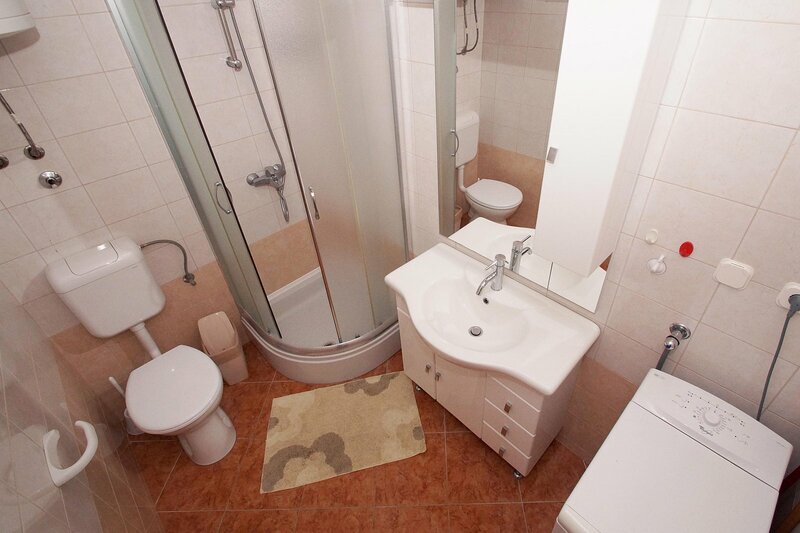 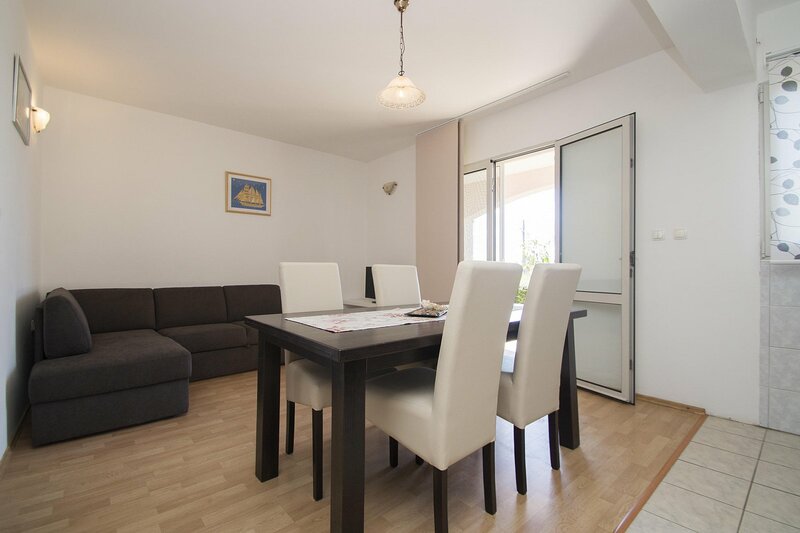 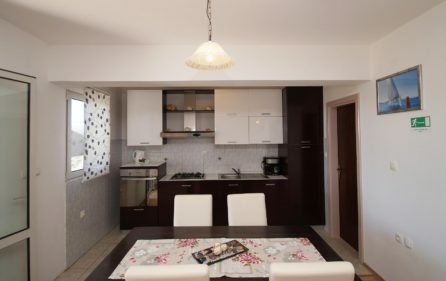 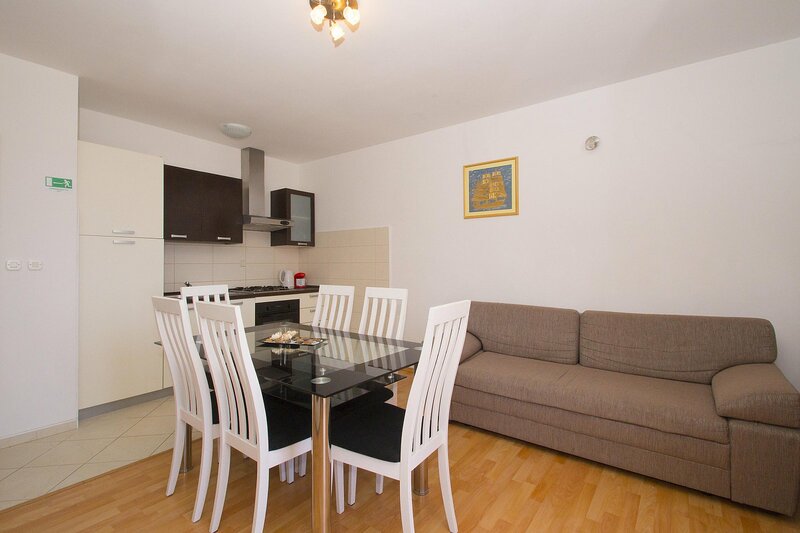 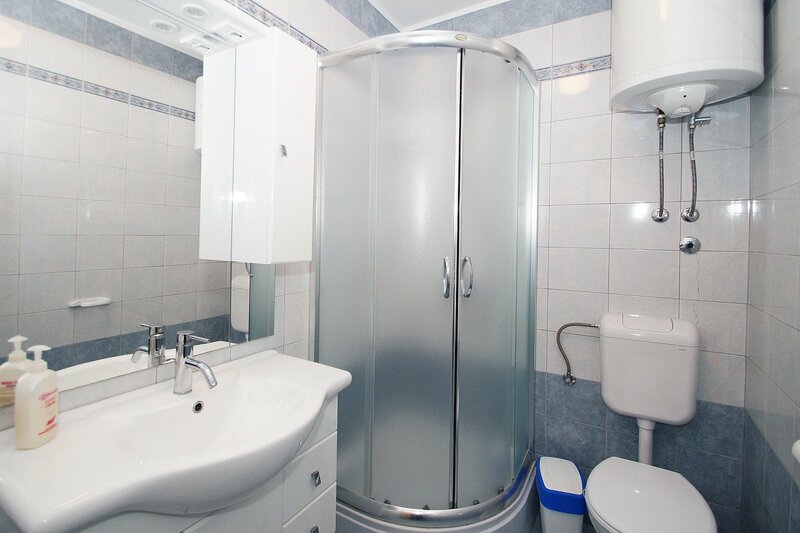 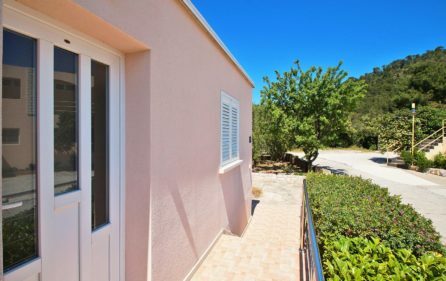 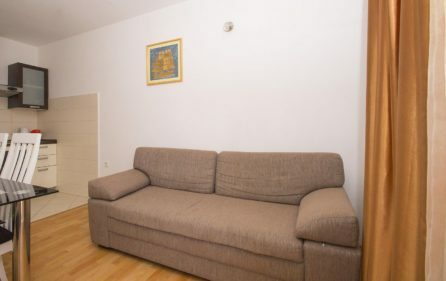 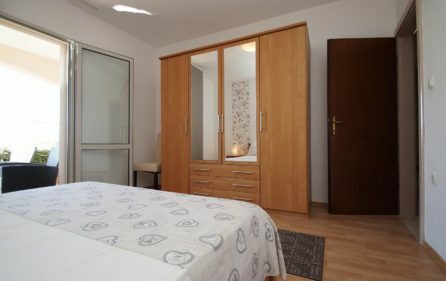 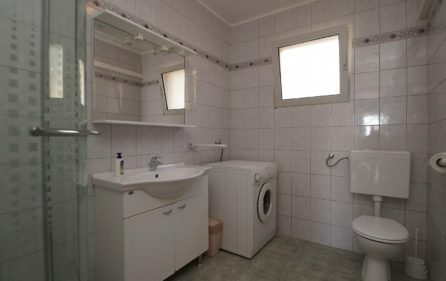 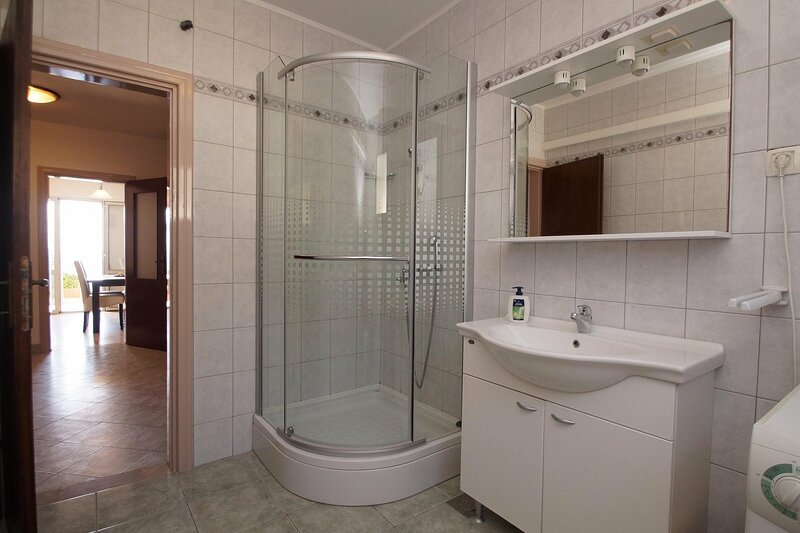 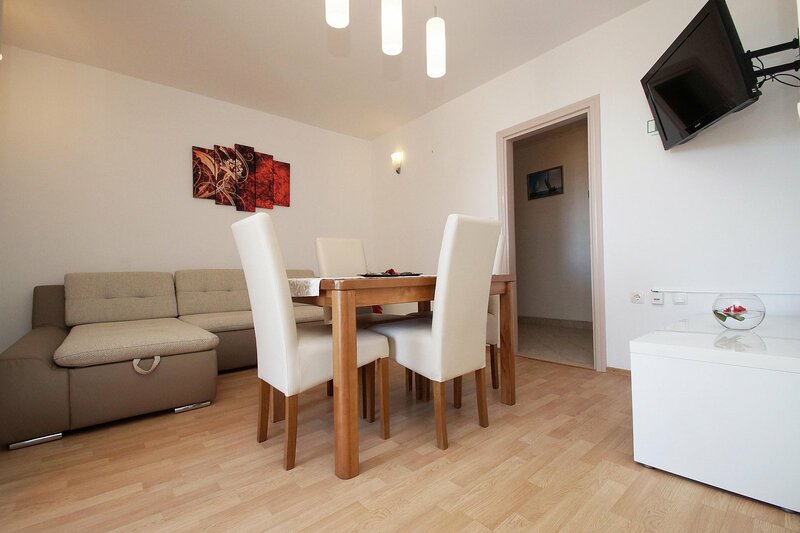 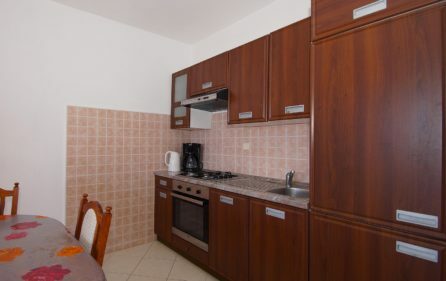 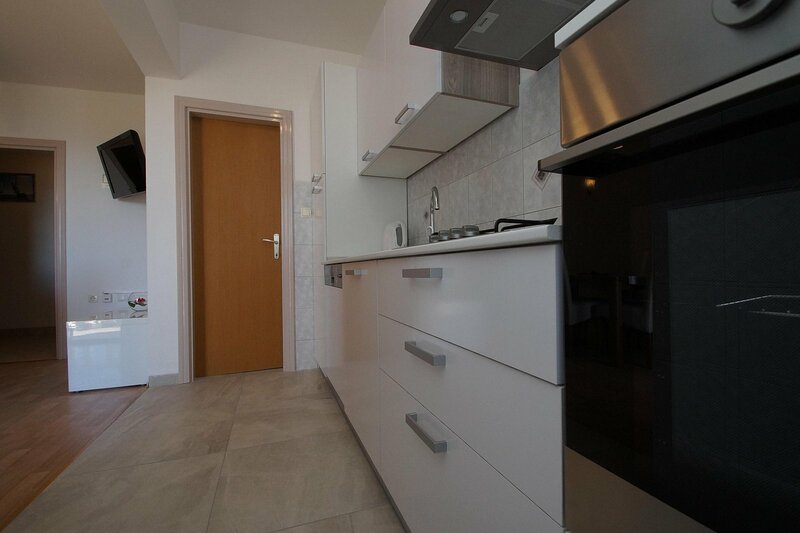 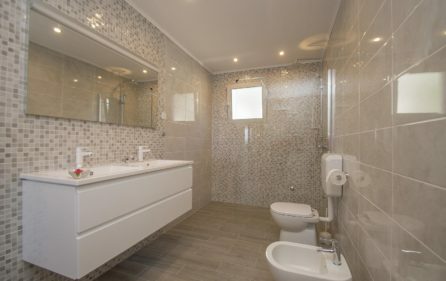 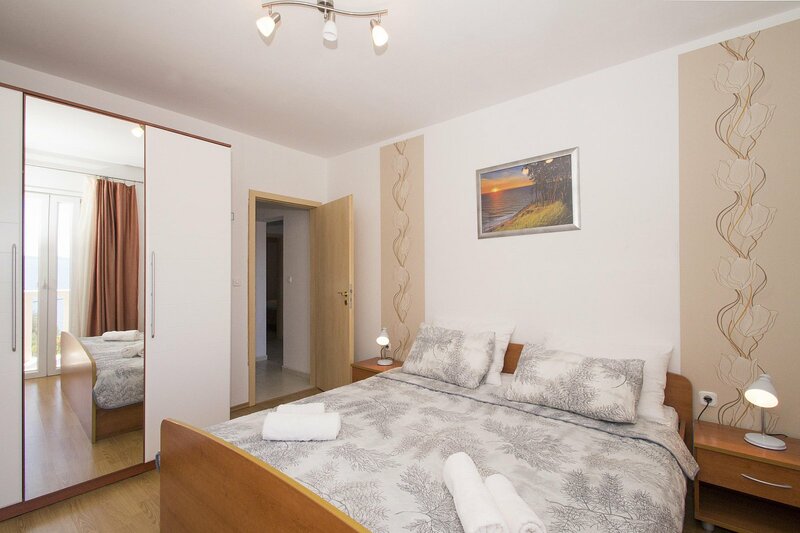 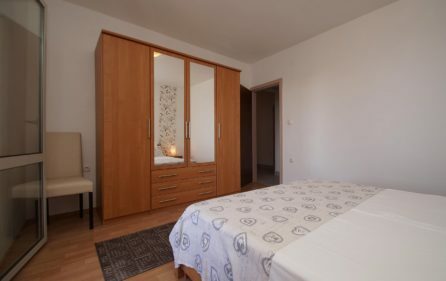 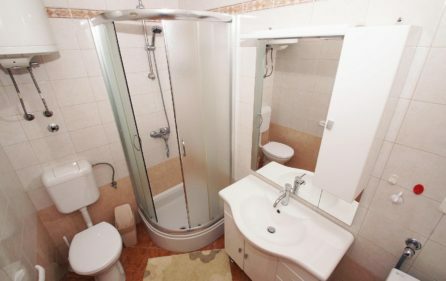 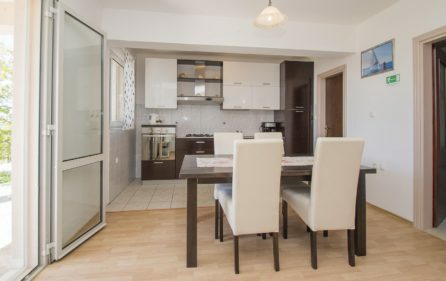 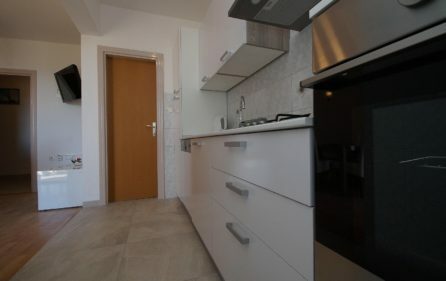 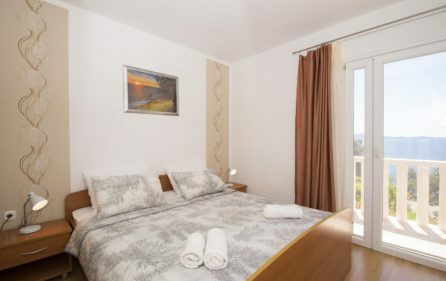 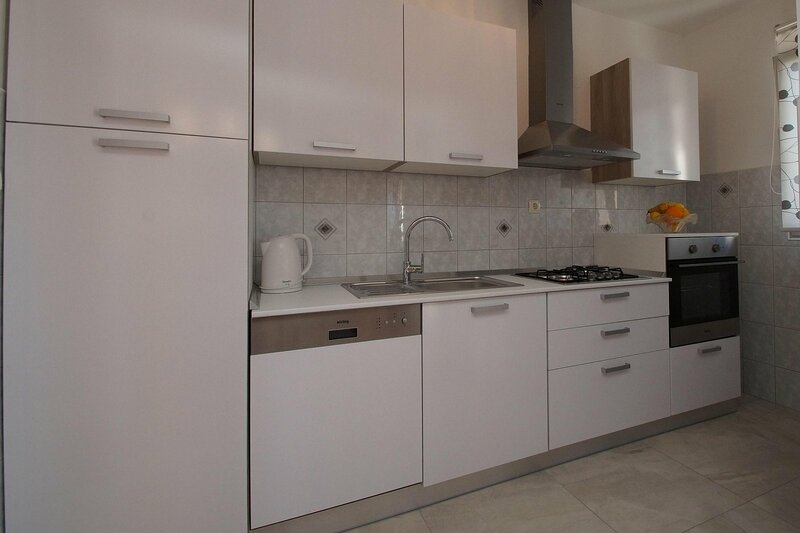 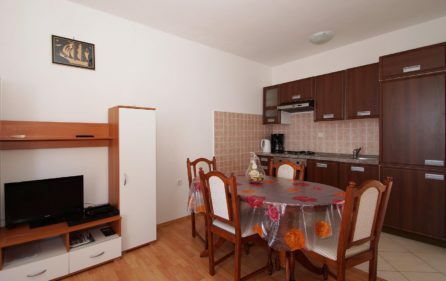 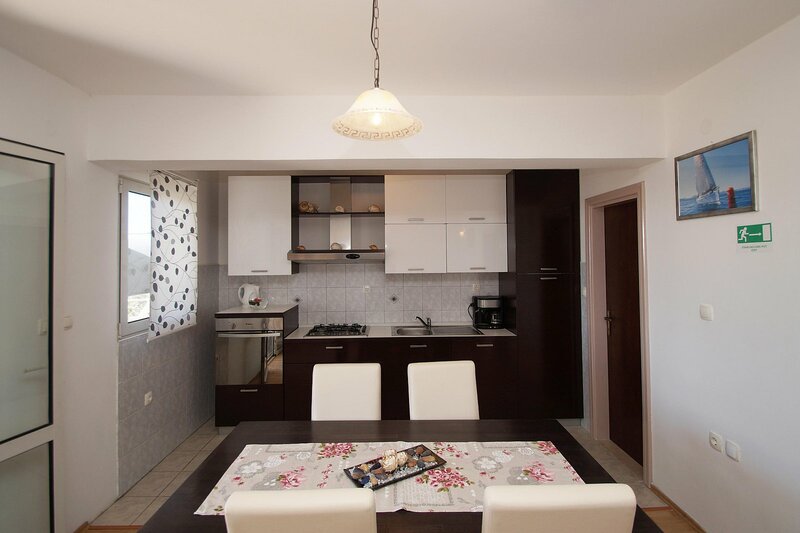 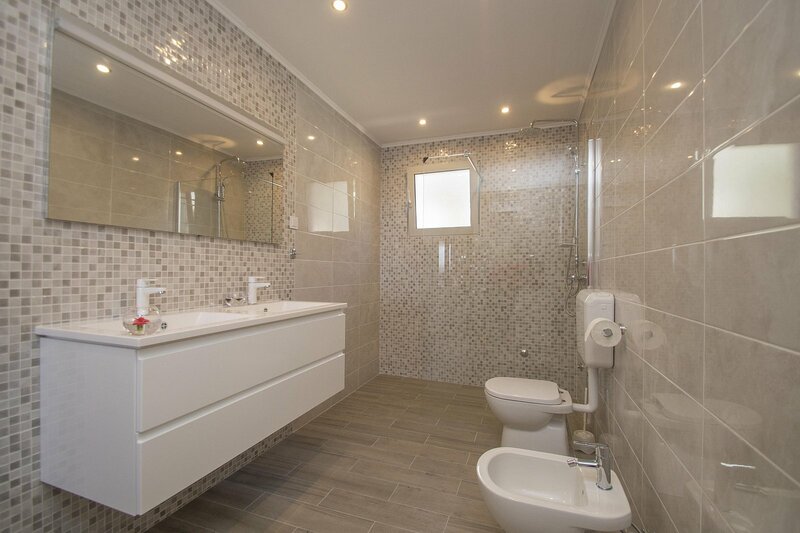 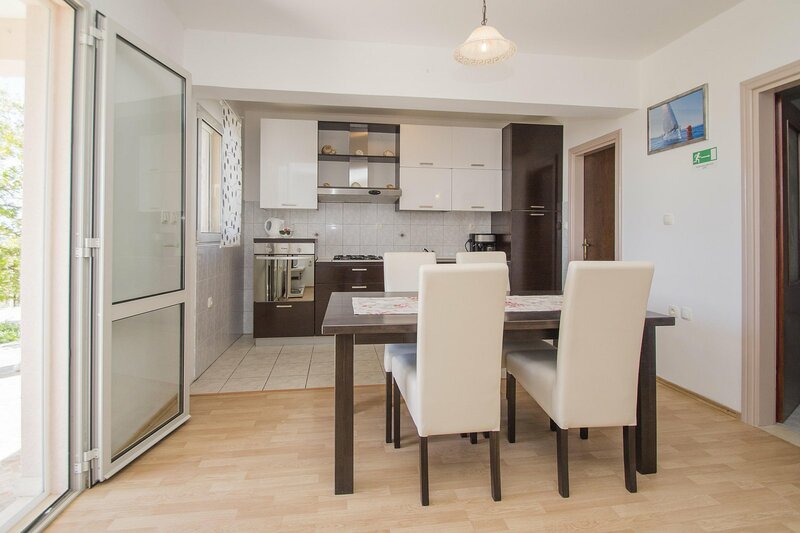 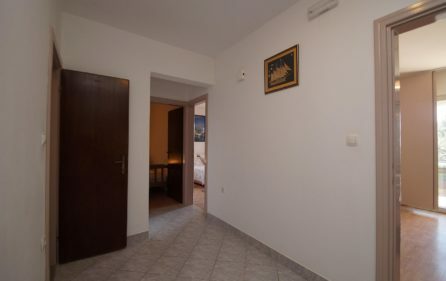 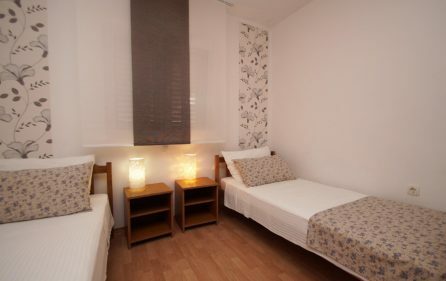 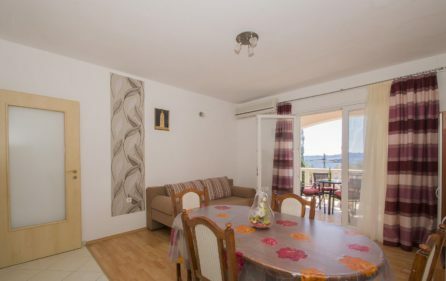 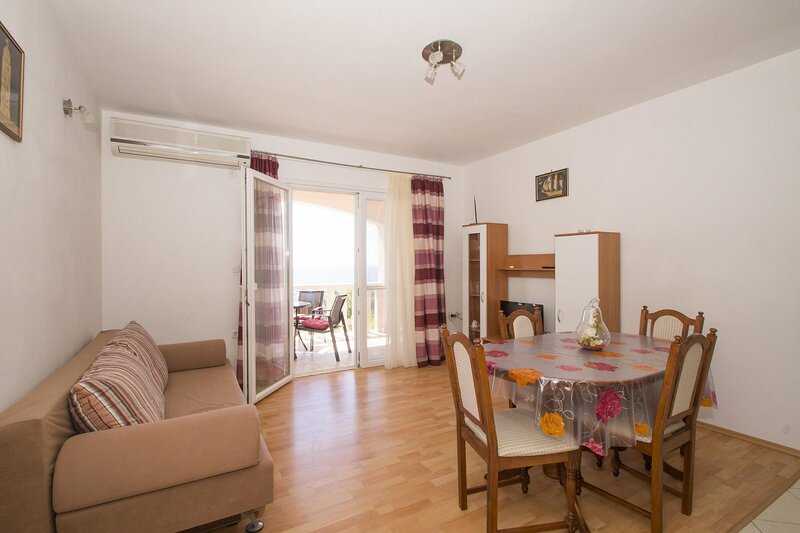 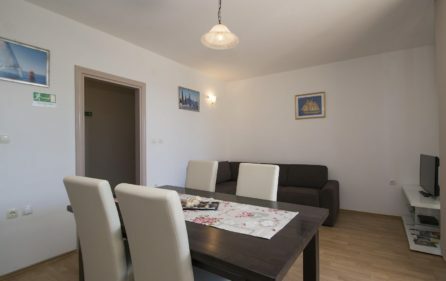 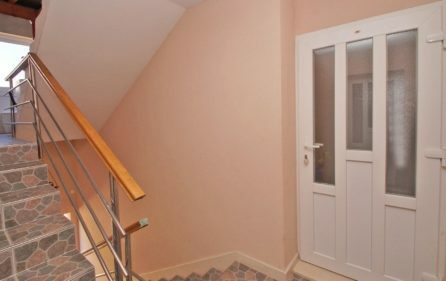 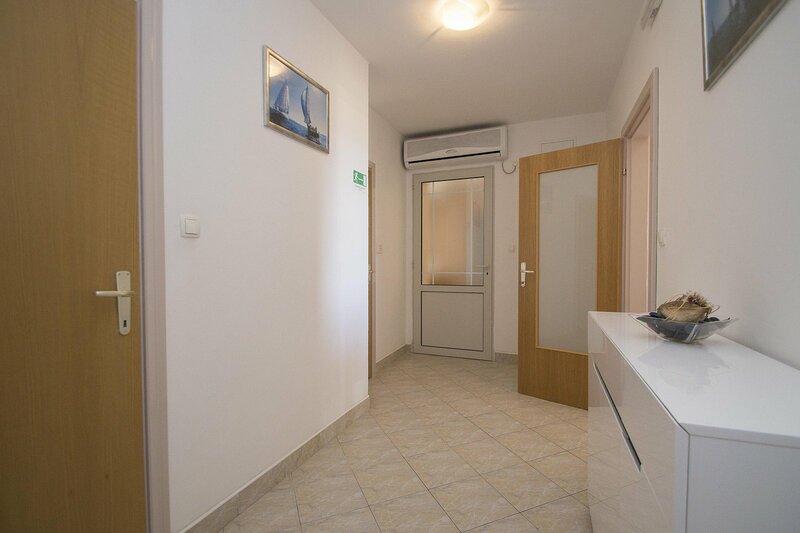 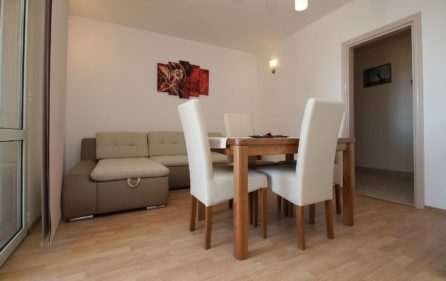 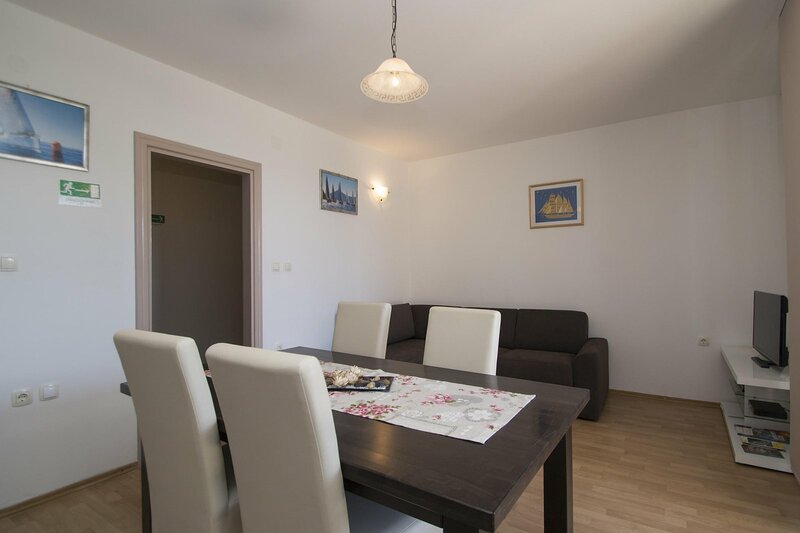 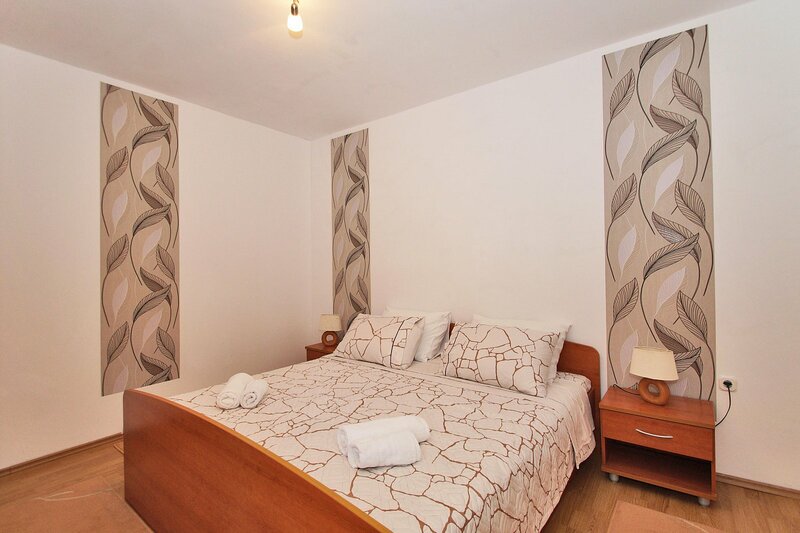 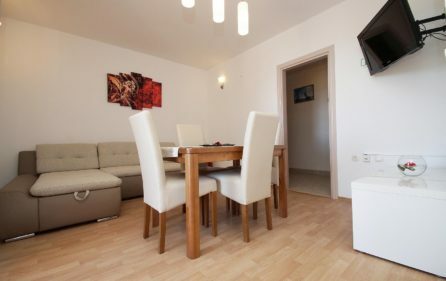 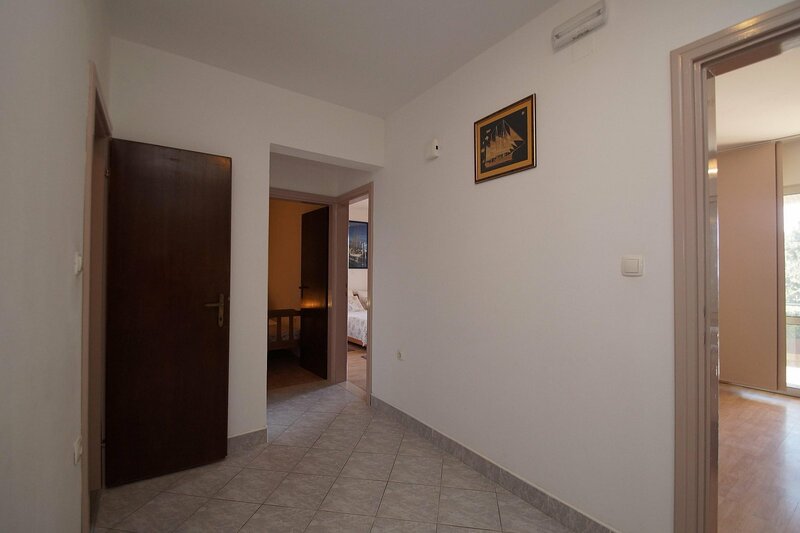 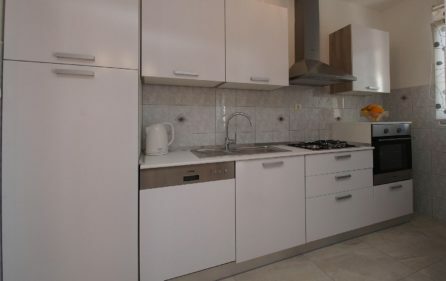 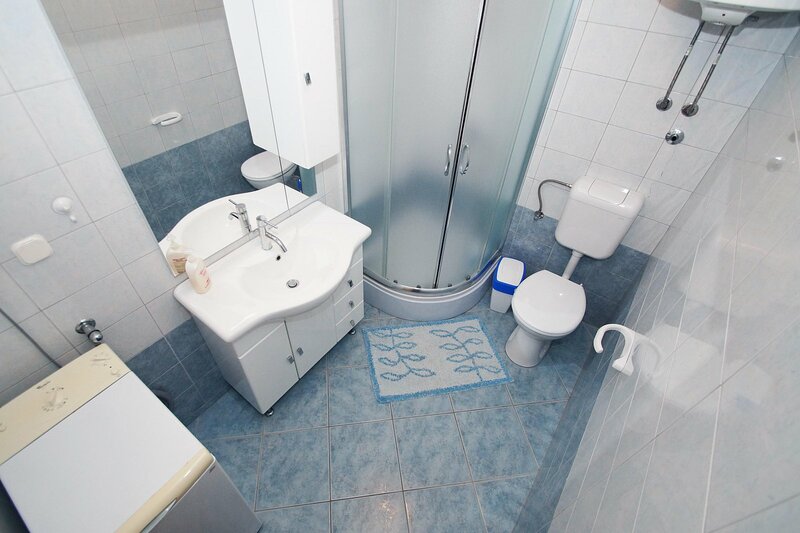 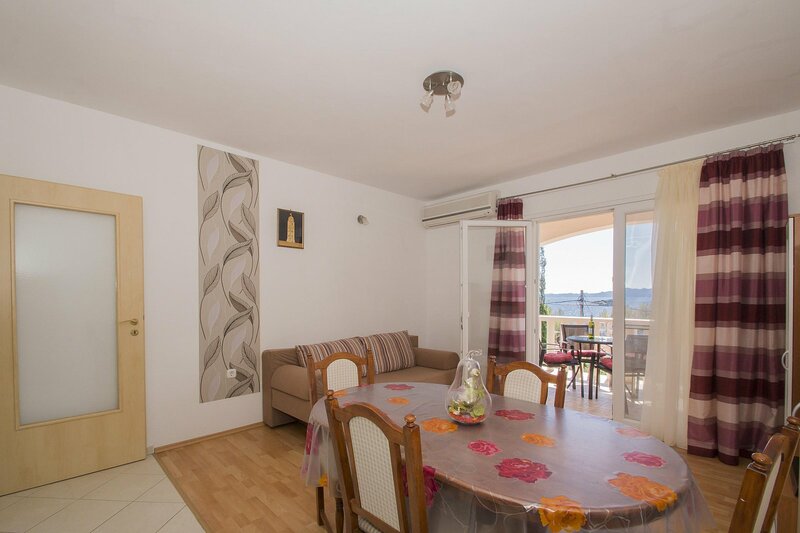 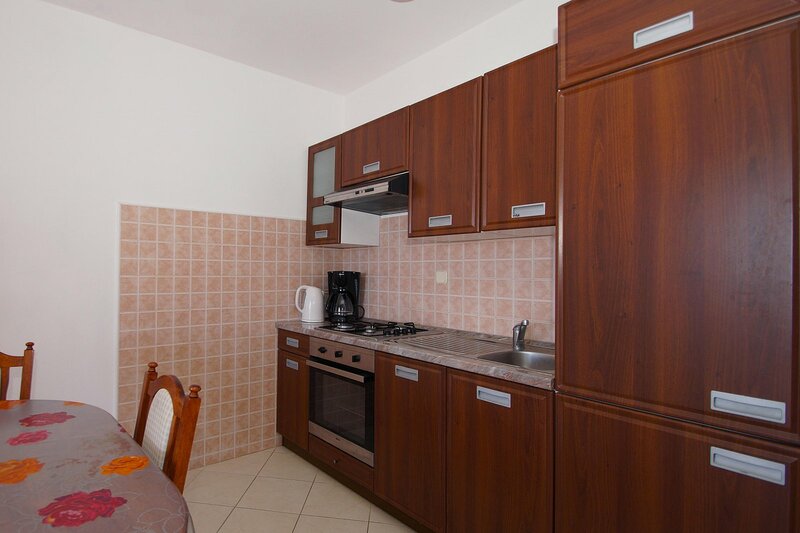 It is a one bedroom apartment with a king size bed, bathroom and a living room connected with kitchen and a dining area. 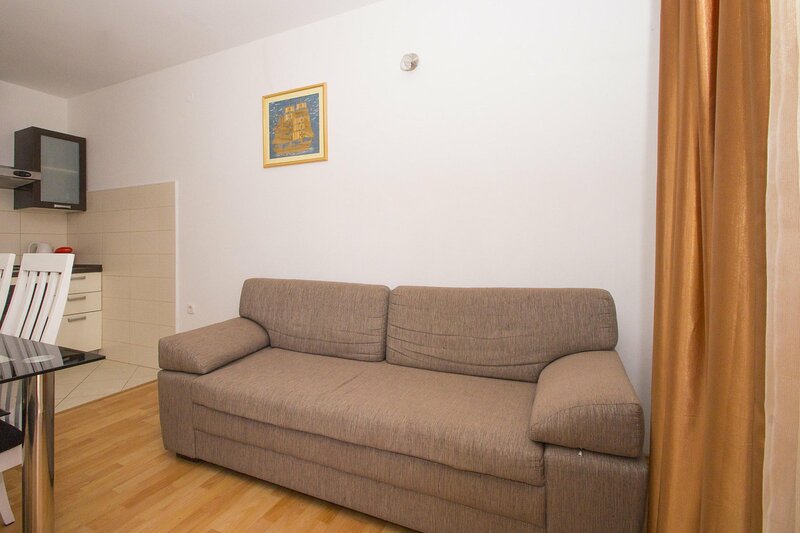 This apartment is cheaper because it can accommodate less guests. 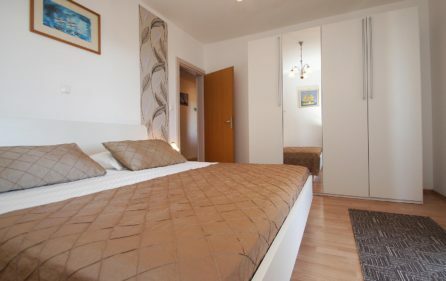 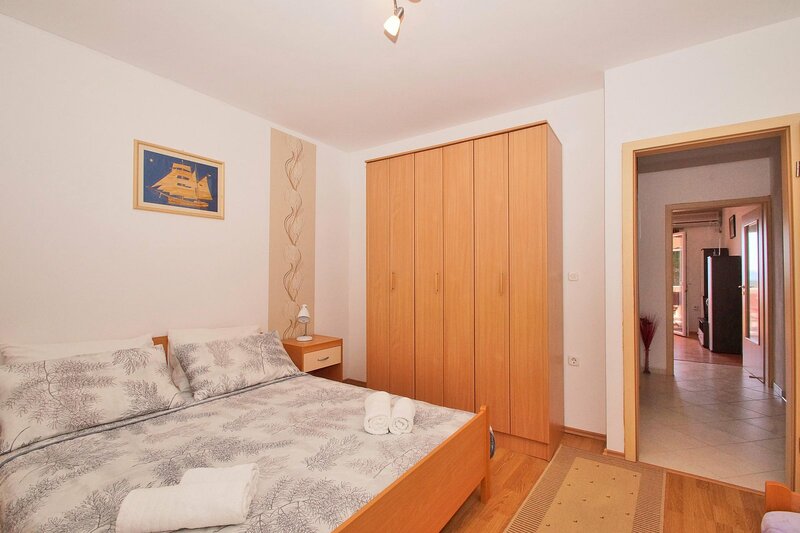 Fourth apartment can accommodate 4+1+1 guests (sofa bed and additional bed). 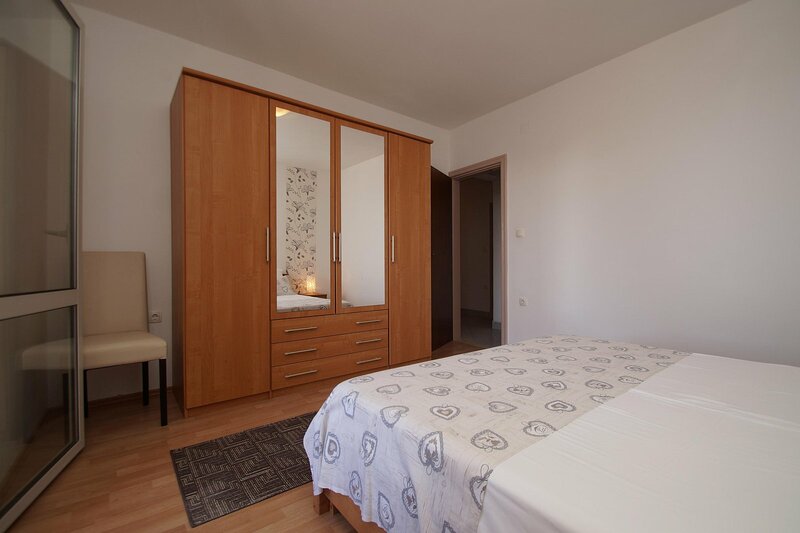 Inside you will find two bedrooms with a king size bed, fully equipped kitchen with a dining area and two bathrooms. 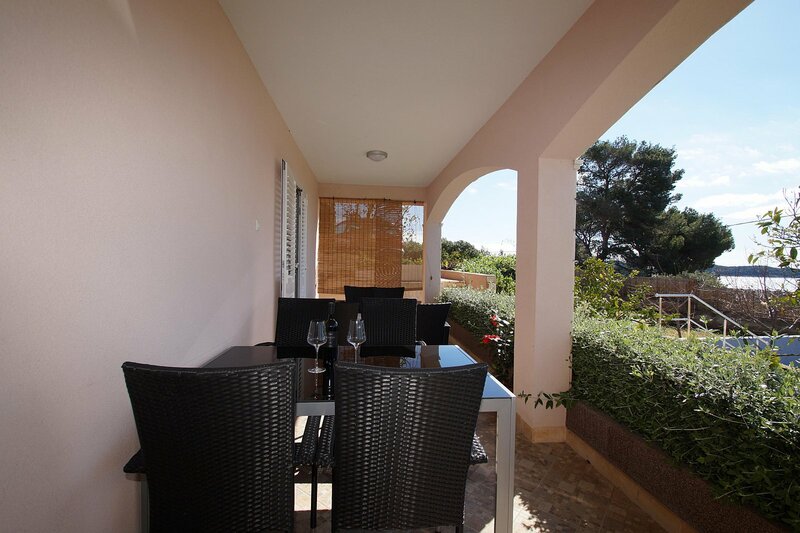 Wifi and air conditioning throughout the property. 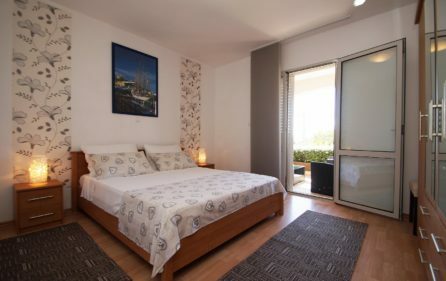 Minimum stay during the season (July,August) is 7 days, changeover day is Saturday. 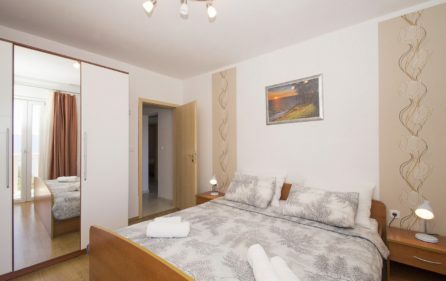 Minimum stay during the off season is 4 days. 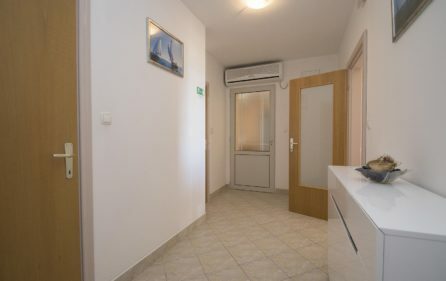 Using of the gym and a swimming pool needs to be arranged with the owner because it is not included in the prices of the apartments. 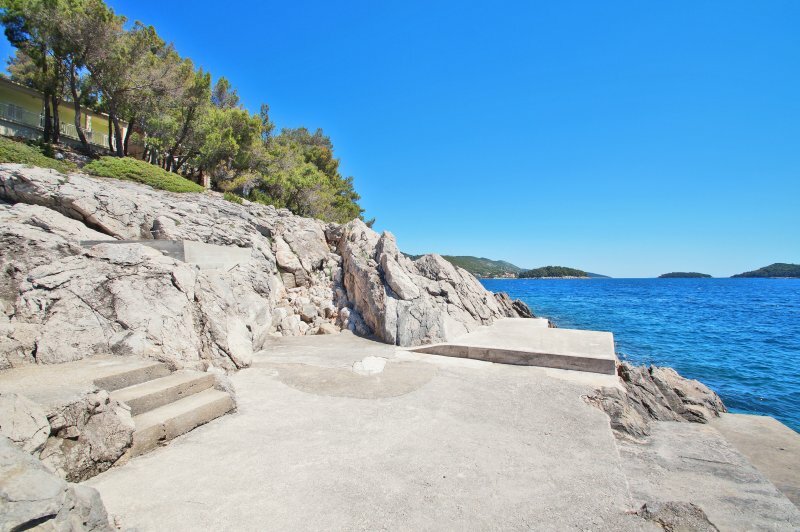 Vitamin sea house is a divided, small property located beneath the apartments. It is surrounded with the Mediterranean plant life and trees. 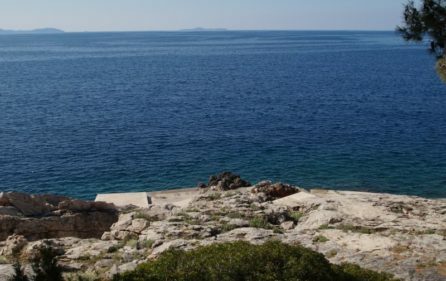 Distance from the sea is less then 20 meters. The house can accommodate up to 4 guests in two bedrooms with a king size bed. 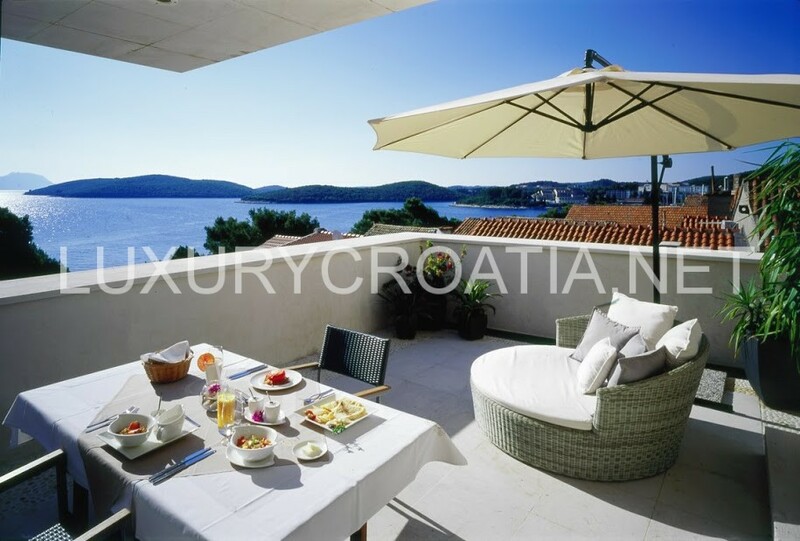 The inside consists of a living space connected with the kitchen and dining area with a direct access to a spacious terrace.